My Scotrail - Spirit of Scotland Winter 2017. — NORTH BLOG. My Scotrail - Spirit of Scotland Winter 2017. On this Scotrail Adventure we will be using the Spirit of Scotland pass which currently has a 20% Discount between 1st November 2017 and 28th February 2018, and we would highly recommend trying it. Our goal on this journey was the challenge of making the most of Scotland using the Spirit of Scotland pass which includes travel on select trains, buses/coaches and ferries getting to a variety of destinations doing something fun that people of all ages can take part in, whether travelling solo, with friends, or with family. An adventure to showcase travelling to places you wouldn't normally think of going, and taking part in activities that can be enjoyed during the winter months. 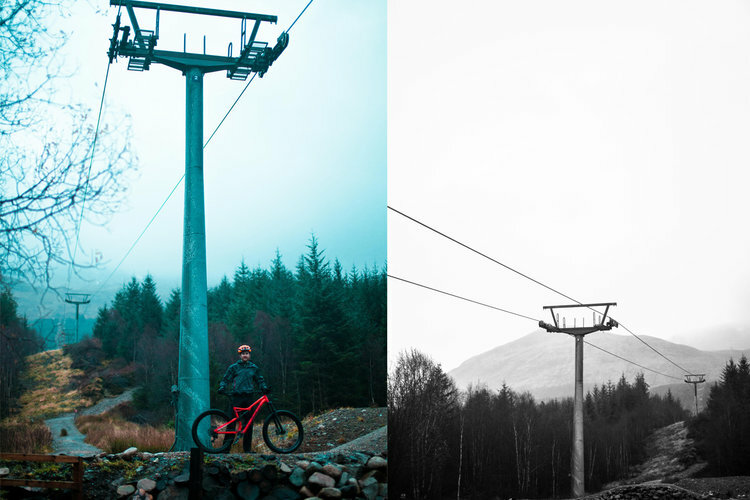 When arriving at Nevis Range we were introduced to a friendly face that was Emma Holgate, a local Mountain Bike guide. Emma was going to be our helpful guide on the hills today, but before we hit the hills we all got to know one another over a very yummy lunch served at the local cafe which was amazing. A quick change of clothes followed, then it was time for some intense Mountain Biking with Emma, who was full of smiles and ready to go. Myself and Jawn were extremely excited about this activity, Jawn is really into biking and commutes daily on his bike to work, and I'm a keen mountain biker. It was a little overcast, slightly raining and snow on the hills, but the weather wasn't stopping us, and we were ready to get out on the track. Fort William is internationally known for hosting the Mountain Bike World Cup every year which was another reason both myself and Jawn were very excited to have a go on this world renowned track. You don't always need to get a local mountain bike guide to take you out on the track, as you can also go yourself, or take your family and follow the signs that are all clearly marked for the different routes from easy to hard. But we wanted to make sure we got all the hot insider tips from the awesome Emma on the tracks so we could ride our best and get the most from the experience. The mountain biking was coming to an end, we had to get moving to our next adventure, after a fun filled time going fast down the Scottish Hills in Fort William with our local guide Emma. We grabbed ourselves a hot chocolate and a wee slice of cake from the cafe. Do make sure you get some cake, its really good, and we will definitely be back again not just for the biking but for some more cake. We then got the 20 minute number 21 bus from Nevis Range to Fort William bus station, making sure we caught the next bus, number 44 to Kinlochleven which would take around 50 minutes before a short walk to Ice Factor for our next activity. Ever since retiring from professional Ice Hockey and the adrenaline involved in the sport l have become very fond of climbing, which I am sure you will see from other blog posts and my photo sets. l was super excited about this next activity... Ice Climbing at Ice Factor (www.ice-factor.co.uk) with the worlds biggest indoor Ice Climbing walls. Yes! Loved this activity. When you think of Ice climbing, normally people tend to think the French Alps, Canada, Norway and don't ever think Scotland, but Scotland has some of the best outdoor ice climbing in the world, and even better that you can ice climb year round with the help of the indoor walls at Ice Factor, perfecting your skills. If you have never ice climbed before or don't have any of the gear, don't worry! They have all the gear that they will happily provide and you can book in with an instructor who will teach you the ropes, if you don't have a chance to go with a friend that is experienced. It's a lot of fun no matter which you choose. Myself and Jawn were booked in for a 2 hour slot on the ice walls, and Jawn had never been climbing before nor belayed anyone, so l ran through the basics with him. It didn't take long for Jawn to get into the rhythm and feel of working with the ropes. Before l knew it Jawn was getting stuck in on the ice wall getting over a few of his fears and gaining his confidence which was great to see. After an epic time on the wall, we were ready for some food after a long fun filled day and even better seeing the massive smile on Jawn’s face after ice climbing. We got the 9.30pm, number 44 bus back to Fort William grabbing some snacks from a local store, then a short walk to our hotel for the night before the next activity we had awaiting us. Another early start, catching the 7.30am bus from Fort William bus station to Inverness which was just short of 2 hours. The journeys never feel that long with the views and especially if chatting with friends. We had not eaten breakfast yet, but we had heard that Rendezvous cafe did great food and Jawn and l were craving pancakes, so that's what we went for. We then headed to Clansmen Harbour to meet Jacobite Cruise (www.Jacobite.co.uk). The pancakes were delicious btw, exactly what we needed before our cruise. When arriving at the Clansmen Harbour we were a bit early for our cruise, but thankfully there was a nice cafe so we grabbed a quick coffee then headed down to the harbour boarding the Jacobite Freedom Cruise for some Nessie spotting and to explore the ruins of Urquhart Castle. If you don't know who Nessie is, Nessie is the Loch Ness Monster who has been spotted in the famous Scottish Loch Ness. The cruise was great, the crew were all really nice and the tour guide was extremely cheery on the speaker giving you a full insight about some of the history of Loch Ness and Urquhart Castle. Sometimes it can be quite windy and cold on the ferry but there is an inside section which is very cosy and warm, plus sells hot drinks and lots of delicious snacks. The ferry ride is around 30 minutes before you arrive at the stunning Urquhart Castle and the beautiful views surrounding it with the option to stay on the ferry for a tour slightly further down Loch Ness or get off and explore the castle, with some extra time to visit the museum, shop or even the cafe if you need more hot drinks. Scotland can get very cold, especially this time of year, so hot drinks are always welcome. As you'll see we were fond of a warm top up. Urquhart Castle is exactly the type you would imagine to see in a fairy tale, and even with all its history and the past events that have happened at Urquhart Castle it is still very stunning and the surroundings very picturesque. We spent roughly an hour before the Jacobite Freedom Cruise came back to pick us up which worked out perfectly, we made sure to sit outside on the ferry this time even though it was windy to embrace the crisp fresh Scottish cold air before arriving back at Clansman Harbour. We definitely felt the chill of the wind when we got back so we made sure to grab a nice warm bowl of soup from the cafe connected to the Clansman Hotel warming us up before catching the number 302 bus from Clansman Hotel back to Inverness. On this journey so far it almost seems like we have went from activity to cafe, to activity then back to a cafe, having fun not only at the activities but getting to meet local faces, and indulge in nice warm hot drinks and tasty local food along the way which has added to the overall experience. I am a true believer and supporter of always think local first, you're giving back to your community, and the majority of the time you always end up meeting some of the coolest friendliest local people, whilst getting great traditional Scottish food and often an insight into the area that you wouldn't normally pickup. After our day exploring Loch Ness and Urquhart Castle we arrived back in Inverness making sure we caught the 5.30pm Train to Aviemore taking around 44 minutes. We had a room booked in Cairngorm Hotel which is directly across the road from the train station making it super easy. We dumped our bags in the room then quickly made our way back onto the main street in Aviemore keeping an eye out for another local cafe and any local sites. We found ourselves at Cairngorm Mountain Sports Cafe, grabbing a delicious hot chocolate with lots of marshmallows and each picking from one of the many delicious choices of cakes on offer. After our yummy hot chocolates and cakes, we headed back to the hotel grabbing some snacks on the way, catching an early night sleep before our next adventure day. Today we were a little worried by what the weather forecast had said, bad weather and storms. Uhoh. It may seem like it's not always the best to be up North in Scotland at this time, but this is exactly why we are here right? To see what we can do in the winter months, and there were plenty of helpful locals around if needed, so perfecting timing. First thing first, we made sure we got some good food in our bellies, hotel breakfast it was which was great! 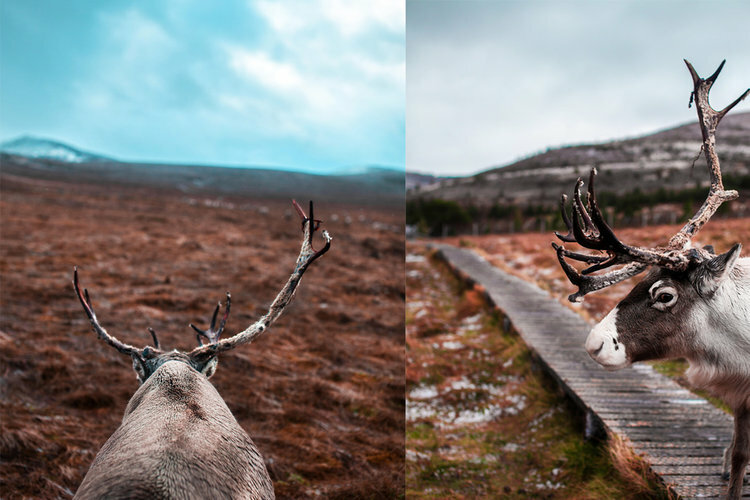 After having a yummy filling breakfast the weather forecast was still saying bad weather, our plans were to visit the Cairngorm Reindeer Centre and take the Funicular Lift up to the top of Cairngorm Mountain. Unfortunately the Funicular was closed due to bad weather but we still had hopes that the Reindeer Centre was not closed. We took our chance getting the number 31 Bus from Aviemore to Glenmore Visitor Centre taking only 14 minutes. Easy! When we arrived at Glenmore Visitor Centre, the Reindeer centre was only a short walk away, and we were praying that they would still be open. Good news! As we asked the lady she said they are open during all types of weather, the reindeers love winter right? and the tour guide started in 30 minutes on the hill. This time we took the option of a car ride up, with a short walk from the car to where the deer are, this is where you can meet, hang and feed the deer during the tour. A great chance to get to know these amazing creatures. We stayed for an extra hour on the hills purely because the scenery is beautiful and having the opportunity to hang out with the deer is a really cool experience. The tour guides are also very nice and chatty giving answers to any questions you have, so don't worry about awkward silences or asking questions. Everyone is very friendly and great atmosphere for adults and kids alike. There were about 10 people on our tour including young children and the cold didn't seem to bother them which was great, but over time it can get very cold and some may want to leave and warm up to our advantage, staying an extra hour gave us the opportunity of getting to hang with the deer one to one. 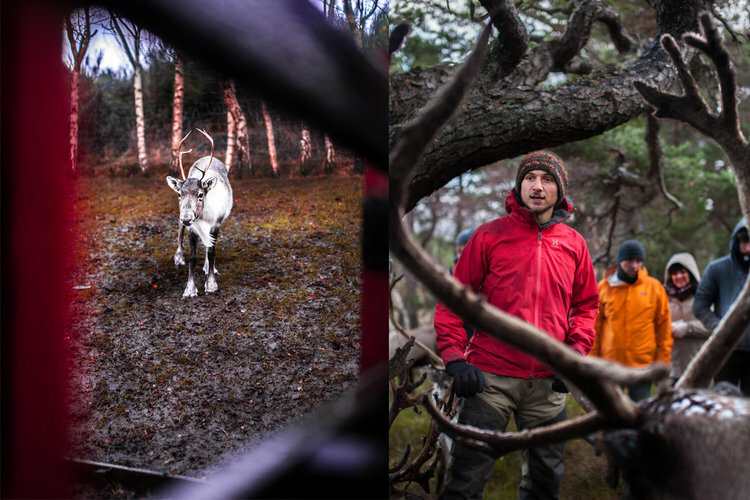 After a good amount of time spent on the hill with the deer, we decided to take the beautiful walk downhill in the snow back to the Reindeer Centre. We had about an hour to kill until our bus back to Aviemore, so we headed into Glenmore Visitor Centre where it was nice and warm sitting down in you guessed it! The Cafe getting some hearty food along with some hot drinks. Our day was coming to an end and it was time to get back on the train to head home, we both grabbed the Train back to Glasgow for a nice chilled journey. We can happily say that we are once again very happy with the Spirit of Scotland pass and the added bonus of it being on 20% Discount until end of February. As I touched on earlier, it's sometimes easier taking the train not having to worry about driving by using local transport, plus its good for the environment leaving our cars at home at times. 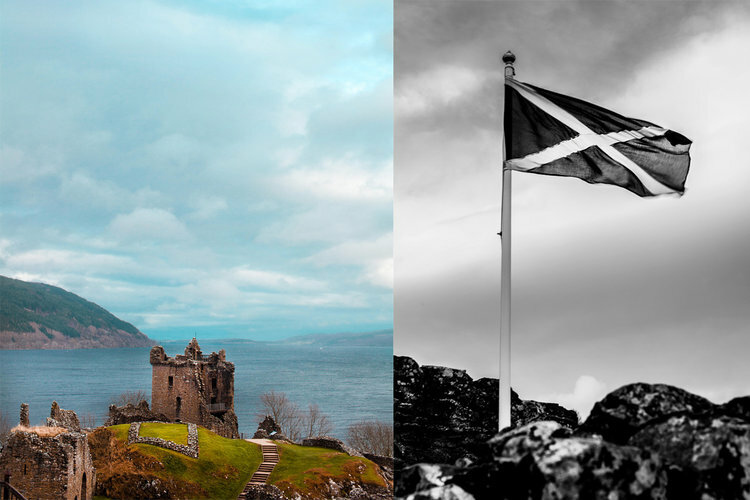 It's been really cool travelling this way as you get the opportunity to mix with locals more and for me thats what makes Scotland great, along with the amount of activities you can do plus the biggest advantage of all, the beautiful scenery here. 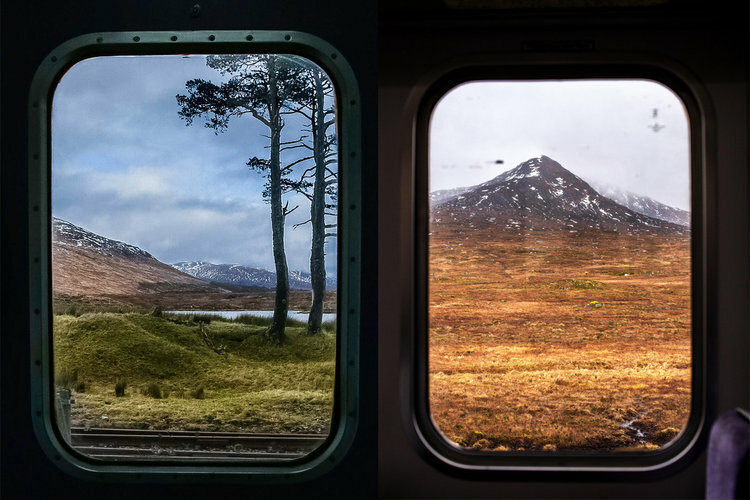 We look forward to sharing more of our Scotrail adventures with you and we look forward to hearing about any adventures you get up to here in our magical homeland.